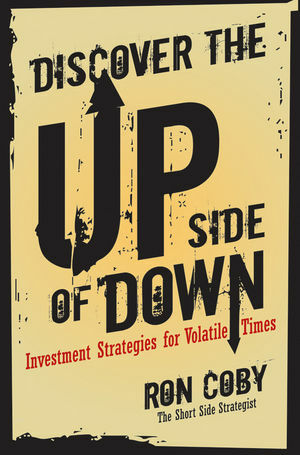 Discover the Upside of Down enlightens readers and give them investment strategies for both protection and profits. Chapters include information on the hot button economic topics of today and for the foreseeable future: oil, gold, real estate, stocks, the dollar, the U.S. and global economies and the future outlook from a longterm viewpoint for each. A timely book with a timely message, this book targets the investor concerned about maintaining their investments during volatile times. RON COBY is a twenty-one-year industry veteran with a diverse background in securities. Starting on Wall Street in 1987, he has worked as a stockbroker, syndicate manager, investment banker, financial analyst and market strategist, venture capitalist, and currently as a hedge fund manager. A student of market history, Coby is passionate about his short side strategy—developed from an intense trial-and-error method of stupendous wins and disappointing losses while trading in wild bull and vicious bear markets. Currently, he is a partner in Coby Lamson Capital Management. Get to know Ron Coby and receive more information about this book by watching his video presentations at www.CobyLamson.com. Chapter 3: Today’s Dollar Is Worth Less, Tomorrow’s Dollar Could Be Worthless. Chapter 11: My Beat-Up Chevy and the 10 Iron Laws of Investing.